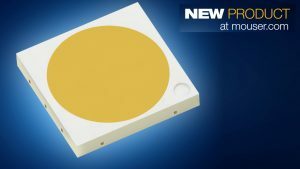 Mouser Electronics, Inc., the industry’s leading New Product Introduction (NPI) distributor with the widest selection of semiconductors and electronic components, is now stocking LUXEON 5050 multi-die LEDs from Lumileds. The LUXEON 5050 package provides high flux at high efficacy, enabling designers to reduce LED count and cost in industrial, indoor, and outdoor lighting fixtures. The Lumileds LUXEON 5050 LEDs, available from Mouser Electronics, use an industry-standard 5050 surface mount package with a small, 4.6mm light-emitting surface (LES) to make it easier to achieve high center beam candle power, enabling single-optic and directional fixture designs. The LEDs are available in color rendering indexes (CRI) of 70, 80, and 90 and color temperatures from 2700K to 5700K. Hot-color targeting ensures that these LEDs are within their color target at application conditions of 85 degrees Celsius. 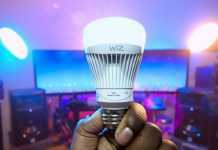 The LEDs operate on a typical forward voltage of 24.5V, which enables the use of low-cost and high-efficiency drivers for all solid state lighting applications. The LUXEON 5050’s surface mount device package features a thermal resistance of 1.9 K/W, which greatly reduces thermal management needs, and the LEDs are binned within 3-step and 5-step MacAdam ellipses to ensure color uniformity. For more information, visit http://www.mouser.com/new/lumileds/lumileds-luxeon-5050-led/.